In premodern China, the traditional Chinese thinking pattern had a strong influence on the practice of engineering and on social development. This thinking pattern is still both influential and valuable today. In this chapter, we characterize the traditional thinking pattern from four perspectives: (1) at the ontological level, it presents itself as an organic entity; (2) at the epistemological level, it relies on intuitional experience; (3) at the methodological level, it highlights the notions of ­correlation and flexibility; and finally (4) at the ethical level, it advocates the morality of yi dao yu shu (mastering technique with dao) and pursues the harmony between a number of related contextual factors. Moreover, in this chapter, we indicate the influence of the traditional thinking pattern upon the modern practice of engineering in terms of planning, design, implementation, testing, and maintenance. 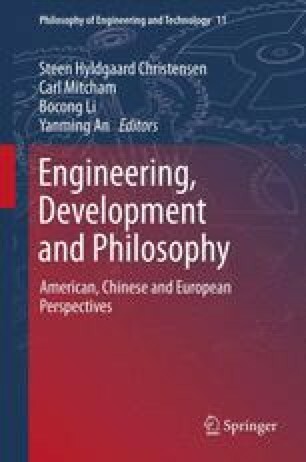 Finally, we argue the case that the traditional thinking pattern can be recommended as a method to improve the professionalization of engineering practice, the quality of engineering education, and the development of qualified engineers. The authors would like to thank Mike Murphy (Dublin Institute of Technology, Ireland) for his great work copyediting and proofreading this chapter. Hermes, Amanda. 2009. The history of Chinese lanterns. eHow. http://www.ehow.com/about_5479247_history-chinese-lanterns.html. Accessed 15 Jan 2011. Shanghai New and Press Bureau. 2007. Fish basin. Cultural China. http://kaleidoscope.cultural-china.com/en/10Kaleidoscope1345.html. Accessed 15 Jan 2011. The Chinese Academy of Engineering, The Engineering Academy of Japan, and The National Academy of Engineering of Korea. 2004. Declaration on engineering ethics, November, 1, 2004. The Engineering Academy of Japan. http://www.eaj.or.jp/openevent/declaration/declaration_e.pdf. Accessed 6 Jan 2011.